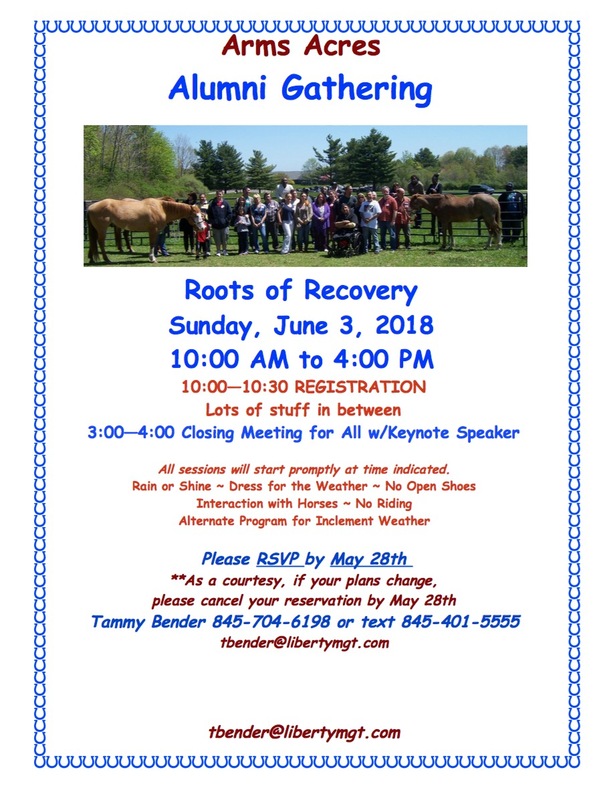 Arms Acres will be hosting the next Alumni Gathering on June 3, 2018. ARMS ACRES IS NOW ON FACEBOOK! Click HERE to visit and receive updates! Through the years, over 50,000 people have walked through the doors of Arms Acres seeking a better life, free from the suffering the disease of addiction brings. Every one of you has been important to us. Our staff has been as touched by your visit here as we hope you were by your experience at Arms Acres. Over the years, you have gone on to become a part of a “bigger” plan, making a positive impact on your communities. We want to hear your story. Our staff will be excited to hear from you, for this is the great reward of working in this field. In addition, we would like your ideas on what we might be able to offer you in the way of support and assistance in meeting the never-ending challenges of long-term recovery. Your comments will help us realize our goal of making Arms Acres the best it can be for people suffering from addiction. Please send your stories, ideas, comments and suggestions to us by submitting your information in the form at the bottom of the page! You can also contact Tammy Bender directly through email or at extension 6198. Message from the Alumni Association Coordinator….. The Arms Acres Alumni Association continues to grow and remains very active in reaching out to others in need of recovery. I hope you can come join us for an inspirational day at one of our upcoming alumni events. Come back and reunite with other alumni and staff along with sharing your strength, hope and serenity with the current clients. • Alkathon meets the last Thursday of every month. Remember how important Alkathon was for you when you were in treatment? Alkathon needs you! If you would like to receive information by email on future alumni events, please send me a note to tbender@libertymgt.com or call (845) 704-6198. Currently I have been sober for the past three years. I got to this point by taking each day One Day At A Time. I first learned this phrase at Arms Acres, amongst many others. At the time it seemed impossible, but actually it is possible. Arms Acres opened my mind to explore other choices. Good choices that helped me cope with navigating through life’s challenges. The Serenity Prayer applies to all situations – big or small and brings clarity to making any decision. I always keep in mind there are many options to choose from when facing adversity, and using is never an option. Arms Acres laid out that foundation and I took it from there. Believe in yourself and have faith! I was at Arms Acres back when I was 17. Although I did use when I got out, the things I learned at Arms Acres finally clicked. I am now 25 and have been drug free for 5 ½ years. I graduated last year with an Associates in Drug and Alcohol Counseling and I am going to take my Certification for my CAC. I have learned that our bad experiences in life can be learned from and actually used not as a bad experience, but into what makes us who we are. Arms Acres taught me so much. And the family day at Arms Acres gave me the strength to tell my family things I thought I never could. Keep doing the great work you guys do. Thank you. One Year Clean Today…..365 consecutive days of living drug and alcohol free. One whole year with being able to resist the urge of putting a needle in my arm, a pill down my throat, and a drink in my hand. One year of undergoing the hardest obstacle I have faced in my 19 years of living. Through hard work and complete dedication, I have achieved the most rewarding things anyone could ask for. I’m a college student today. I can be a daughter today, a sister, a friend and a girlfriend. I can be trusted and relied on without question. I can wake up in the morning and feel alive, remembering everything I did the night before, and knowing I had fun without the help of any substance. I can appreciate the little things that most people leave unnoticed. I can do whatever I want, as long as I try. Throughout the year I have received the best gift anyone could ask for, freedom. Sometimes, the best gifts are the ones that you can’t hold or touch, but the ones you feel in your heart. Some of you will never understand what this process is about, and I can only pray you never do. For those left suffering, there is hope. Thank you to everyone who has supported me since day one, cause not one second of it goes unappreciated. Revelation 21:4 God shall wipe away all tears from their eyes, and death shall be no more. Neither shall there be mourning, nor crying, nor pain anymore, for the former things have passed away. After about five years, I just wanted to reach out and thank you for your part in my recovery. Five years ago, I came to Arms Acres after a nearly lethal overdose of Xanex. I may not have exactly been a model member of your program when I first arrived however, as my time in the program progressed something changed in me. My social worker was incredible. He helped me rebuild a relationship with my family and find closure to issues that I had in my past. He also inspired me to work with youth in the human services field. Five year later, I am a graduate of Human Development and Family Studies from the University of Vermont with a Bachelor’s in Science. 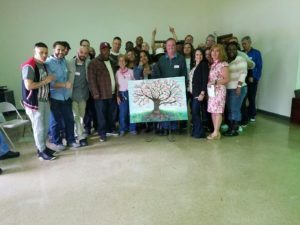 My experience at Arms Acres taught me to help myself achieve happiness and I have paid it forward to the youth that I have worked with in residential facilities. I would love the chance to come and speak to the youth program members at Arms Acres. I remember very well sitting in the community room listening to speakers while eating a peanut butter sandwich and wondering where I would be in five or ten years. I wondered if I would ever be one of those people who made it. I am in such an incredible place in my life that I never thought I would be and never would be if it were not for the help of Arms Acres. As thanks, I would love to come full circle and speak to the youth program. I left Arms Acres a little over eight years ago and it was one of the best things I’ve ever done for myself and my family. I left Arms Acres and went to Sober Living in Delray Beach, FL for about one year and have been sober ever since. It wasn’t always easy, but it was well worth it. My wife and kids have never been happier as well as myself. I work a respectable job and look forward to the future. When I was at Arms Acres, my wife had asked for a divorce. I was then in a position to go to Delray and work on myself. We got divorced, but after it was finalized, four months later, we were back together. So good things do come back in sobriety. Wife, kids, house, job and serenity…it’s all back thanks be to God!!!! My sincere gratitude goes out to Arms Acres and the entire staff. You are all saints in my book. Coming to Arms Acres saved my life and helped give myself and my family back the happiness and comfort that we all deserve. Thanks to this program helped me much made me see the world another way to have fun without drugs without alcohol, when I got to this beautiful program I thought that would come out with my same mind smoking or cocaine inhaler but after that I remove, I was otherwise a new teen that leave all my problems behind and went back to start my life from 0 A new person, I learned many things in acres I realized many things thanks, a latino, I am Peruvian and am now in peru of the more happy with my family, travel so that they would see my change, change that hise in my life and realized and now we are all happy and especially my mom she now is happy with me and on a hand thank you thank you Arms Acres. from your pumpkin dreams and other pumpkins. yucky stuff. He removes the seeds of doubt, hate, greed, etc. His light inside of you to shine for all the world to see. “dance” at the end of the word. I remembered reading that doing God’s will is a lot like dancing. lets the other lead, both bodies begin to flow with the music. pressing lightly in one direction or another. It’s as if two become one body moving beautifully. guide you through each season of your life. Our Higher Power didn’t promise days without pain, laughter without sorrow, sun without rain, but he did promise strength for the day, comfort for the tears and light for the way…..
Are you on our mailing list? Would you like to receive newsletters, email announcements, invitations to Alumni Events? If so, please complete the form below. Your information will not be used for any other purposes other than receiving alumni news.